Canyoning is suitable for groups wanting a real challenge (though nearly everything is optional to some degree) and gives a unique experience exploring the hidden depths of deep rivers and gorges. 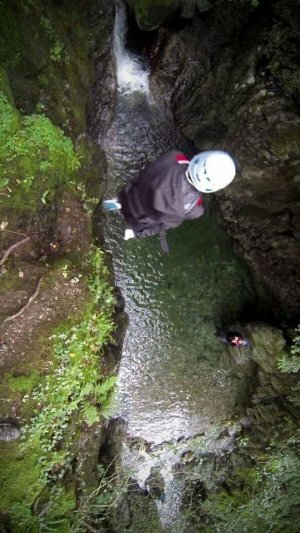 We will jump off waterfalls of various heights, sometimes into tight slots, swim through deep pools and into caves, and abseil and slide down waterfalls. We can choose different routes within the gorges giving different levels of challenge across the same group, we also have a range of gorges on offer giving different levels of technicality. As we move and work as a group this activity is a very social and fun activity that promotes team-work throughout. Thorough briefs and demonstrations will be given buy our qualified instructors who will be at hand to help out and watch over all aspects of the activity and guide everyone individually through the techniques required in the canyon. We offer this activity as either a full day option, a half day option, or as part of one of our Multi Activity Day options. We generally run our group activities in the Lake District, a brilliant venue for all outdoor activities. We can easily offer the service elsewhere though and are able to travel to you. We are very flexible and mobile with this service and can advise on the best place to run a residential programme from and choose the best venues for your selected activities. Please Contact Us to discuss the various options available, we will then put together a quote for you depending on your specific requirements and numbers. See our Group Gorge Scrambling and Canyoning Video.